Driving down the streets of Dubai, one cannot ignore the large puddles of water that cover the side of the streets and sidewalks. These puddles, which are the result of attempted irrigation of green patches and plants, are a big waste. As a result, a very important question comes to mind: Does the UAE have that much water to spare? Water in the UAE is in very short supply. The United Arab Emirates is one of the top 10 most water-scarce countries in the world, and has one of the highest per capita water usages globally. With 550 liters per person per day, a UAE resident consumes more than double the global national average of 250 liters per person per day. Why do people use this wasteful method? Simple: it's the cheapest and fastest way to irrigate the plants, or it may seem so. Although the upfront costs are cheaper, there's a large hidden cost of water that underlies the use of conventional irrigation methods. There are a number of problems concerning spray irrigation but the most important is its inefficiency. 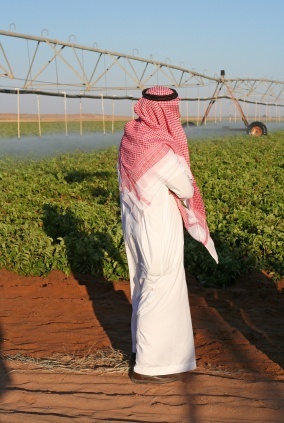 When using spray irrigation (sprinkler systems) in a country as arid as the UAE, 60% of the water evaporates before it is absorbed by the plants. As a result, only 40% of the water intended for irrigation is used, which itself is not evenly distributed. This lack of uneven distribution coupled with the decrease in the amount of water used is detrimental to the plants' health. 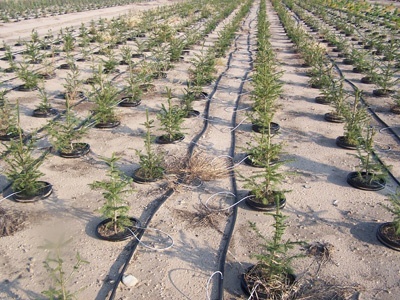 A second method being used in the UAE is an irrigation system consisting of gravel and pipes 60cm below the surface. Before anything is planted, the plot is excavated and lined with a water-proof tarp followed by layers of gravel and dirt placed around a half pipe. The pipe is drilled at strategic areas in order to let water flow through but sand and soil stay out. This method only requires 2.5 litres of water in order to maintain a plot which usually requires 10 to 12 litres. Adjust sprinklers so only the grass and plants are watered and not the streets and side walks. Water during cooler times of the day such as in the morning or evening to avoid large amounts of evaporation. Coordinate irrigation with seasonal rains. Subsidize the installation of more complex irrigation systems (e.g. drip irrigation). Provide preferential loan and credit conditions for farmers that abide by environmentally friendly laws or standards. Launch different campaigns across the the UAE that aim at educating farmers and residents about environmentally conscious water consumption. With water scarcity continuing to reach an all time low, there isn't enough water to be equally distributed between the people of the UAE, let alone water to waste. The time to act is now. Tagged Agriculture, deserts, Drip Irrigation, GCC, Irrigation, Irrigation Method in UAE, Middle East, Spray Irrigation, Sprinklers, UAE, United Arab Emirates, Water, Water Conservation, Water Management, Water Management in UAE, Water Scarcity in UAE, Water Strategy in UAE. Bookmark the permalink. in UAE and its present method of treatment and disposal. give us your email and tell us where you are studying and which level, and we will send to you full information on this new technology( the buried diffuser) , which will be presented at Rass Elkhaima water event the 28 th of November 2013. I am very much inerested with the buried diffuser system would you please send me more information about it. And pics please. Please take a look at our website: http://www.chahtech.com for details and contact information. Thanks for showing interest in the article. Let me know about the information needed. I am interested in your inventions please give me your contacts…. I tried to work with UAE or more specifically Abu Dhabi Municipality, again, in this region it requires true leadership to understand the cost savings and also the quantum of hidden issues. With our proposal, we could have saved them 90% of water usage, however, nobody at the decision making level could really see the benefits to implement our services. I am really thankful to all of above scientists for providing such a helpful information regarding irrigation. Specially Mr. Amor Dakkak. As I am an irrigation professional having M.E Irrigation qualification from Singh Agriculture University Pakistan. I have your years of work experience in the field of irrigation & water management in two projects funded by World bank. Right now I m planing for doing job in Dubai. So the above given information provided by Mr. Amir Dakkak is really useful for me and I need more info regarding Dubai irrigation, it's irrigation departments and the industry and related latest jobs opportunities. Therefore kindly help me Mr. Amir Dalek and others. i wanna know where exactly is this drip irrigtion in UAE located…could sm body plz tell me?? I am working on a research paper. Could you please give me names of irrigation companies in the UAE? What are the prices like? are warranties offered? How long does it take to install such? This is a very useful information with greater water conservation and reduced loss to the atmosphere as water vapor thus plant making almost all of water provided. Please sir I’m a Bachelor of Science Degree holder in Agriculture and would want to do masters in Irrigation Processes. I have done some courses in irrigation at the BSc level. Now looking for vacancy jobs in Dubai in my related field. I will work with enthusiasm to serve and further my education.